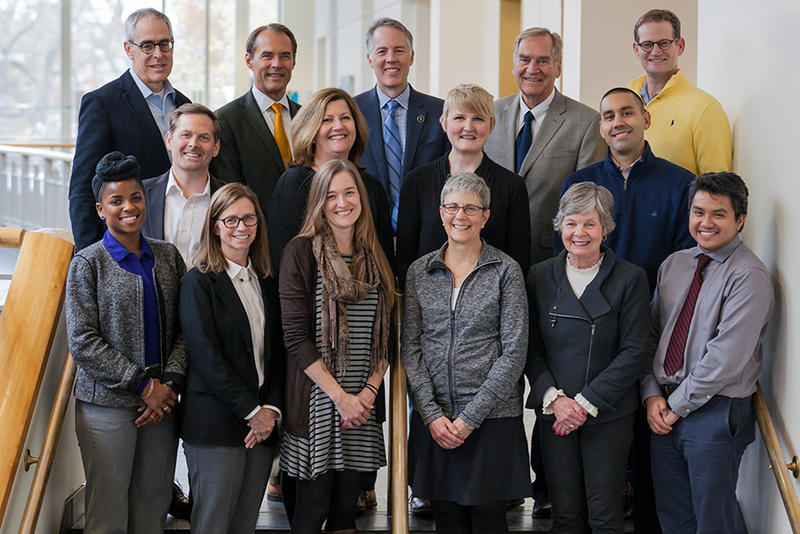 Dating back to 1892, the Alumni Board is a diverse group of alumni who volunteer their time, talents, and energy to provide leadership within the alumni community on behalf of the programs and mission of the college. Arriving from various locations throughout the nation, they meet twice a year, on campus, in an effort to better understand the college and its needs. As an advisory board, they offer suggestions and perspectives gleaned from the larger alumni community, and work with Office of Alumni and Parent Relations on various components of the alumni program. Sixteen alumni and parents are chosen for single four-year terms and a fourth of the Board is elected annually. Pictured L to R, back row: Mark Williamson ’88, Henry Latimer P ’20, Brad Hoff ’89, Lee Sather ’66, P ’92, ’94, ’95, Curt Nelson ’91. Middle Row: Eirik Davey-Gislason ‘94, Lisa Warren ’86, Sonja Clark ’03, Mario Paez ’01. Front Row: Mariah DuBose ’16, Janine Braham P ’17, ’20, Jody Miesel ’01, Kim Brody ’78, Becky Odland ’74, P ’07, Abraham Payton ’08. Not pictured: Cheryl Philip ’10, and Autumn Hilden ’99.